Heading back to school doesn’t mean back to pain, strain or injury because there are easy alternatives to keep kids safe and healthy! A backpack should weigh no more than 15% of a child’s total body weight. Meaning if a child weighs 100 pounds their backpack should weigh no more than 15 pounds in total. 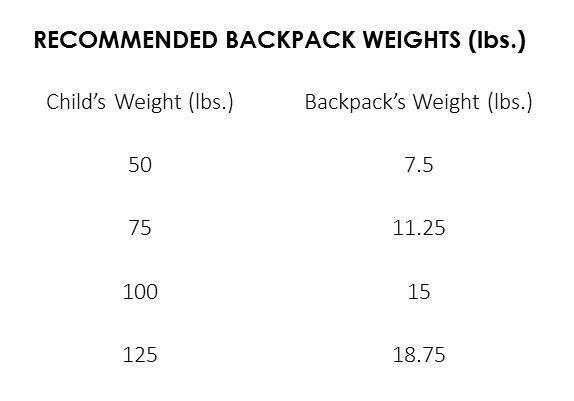 See the table below for recommended backpack weights. Myth busted: Rolling backpacks are not always better for a child’s back. Even if your child isn’t carrying a heavy load directly, they may have to compensate in different ways! If the handle is too short it can lead to poor posture, and lugging a heavy bag up stairs can also cause strain on the back! Not to mention, rolling backpacks may be a trip hazard in a busy hallway. Weigh your options carefully. You can rent or buy textbooks online in hard and digital copies. Having two copies of textbooks (one at school and one for home) is a great back-saving alternative to hauling homework back and forth and may help to ensure that every assignment is completed. Listen up! If your child expresses that it is painful or “too heavy” when carrying their backpack; it is! They experience tingling of numbness in their arms. They have red marks from straps digging into their shoulders, neck or back. Posture is noticeably leaned forward while carrying backpack. Two-straps! It’s best to avoid wearing messenger or one strapped styles of bag. Wearing straps evenly on both shoulders saves strain, pain and prevents future injury because it promotes a symmetrical posture and takes pressure off the back, shoulders and neck when worn properly. Padding! Padded shoulder straps and back panel gives added comfort when carrying a full load and helps to prevent the backpack from digging in and causing pain. Backpacks should be taken on and off with ease! Customize the straps to your child’s body so that they are not straining to reach for the other strap or the bag hangs too low on the back. Adjust the straps so that the load sits properly with the heaviest of the load carried at the center of the back. Distribute weight evenly! Utilize all of the pockets and a hip belt to even out the weight. Avoid putting all of the contents in one area so that the backpack becomes top- or bottom-heavy. Organize and lighten the load with regular clean-outs! Choose a time once a week to clean out the contents of your child’s backpack (this helps to locate “missing” items as well). Preparing ahead and packing only the essentials promotes a healthy back! Scheduled pit-stops! If your child has a locker, encourage them to visit and exchange books frequently throughout the day to keep backpack weight low. Lift properly! Have your child place the backpack directly in front of them and as close to them as possible, instruct them to bend at the knees keeping their back straight and lift using those strong leg muscles! Become an advocate for your child! Ask your child’s school what accommodations they can make concerning digital access to textbooks, lockers, and homework loads. 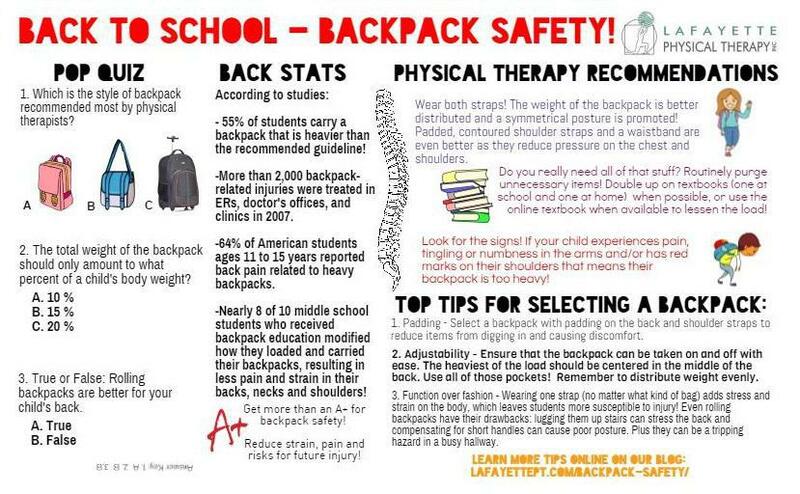 Following backpack safety can promote healthy alternatives to save your child from unnecessary pain, strain and future injury! If pain persists, see what a physical therapy can do to help!